5th Grade Science: A big part of 5th grade science is learning about what scientists and engineers do. Students take on role of scientists and engineers and ask questions, explore the surrounding world through inquiry based labs, work in cooperative groups, and develop science skills. 5th grade will also touch on multiple fields of science such as life science, earth science, and physical science. Students are provided with an interactive write-in textbook as well as an online ScienceFusion account where they can access the text digitally, do video based projects, use digital lessons and virtual labs. 6th Grade Science: 6th grade science has three modules titled “Cells and Heredity”, “The Diversity of Living Things”, and “Human Body”. In Cells and Heredity, we learn the details of what makes an organism and the details of a cell, and how traits are passed from generations in predictable ways. In Diversity of living things, we learn how types and characteristics of organisms change over time and how they are classified. Lastly, in Human Body, we learn how our body works though specialized structures and how to keep our body healthy. Students explore and gain deeper understanding of concepts through many hands on labs and virtual labs. 7th Grade Science: The Seventh Grade Science curriculum consists of three modules titled “The Dynamic Earth,” “Earth’s Water and Atmosphere,” and “Space Science.” In “The Dynamic Earth” module the students study about the Earth’s spheres, the Earth’s geologic history, the Earth’s minerals and rocks, and the Earth’s physical composition, properties, and natural disasters. In the “Earth’s Water and Atmosphere” module the students study about the Earth’s water, the Earth’s oceanography, the Earth’s atmosphere, and the Earth’s weather and climate. In the “Space Science” module the students study about the Universe, the Solar System, the Earth-Moon-Sun System, and Exploring Space. The students enhance understanding of concepts through virtual and hands-on labs. 8th Grade Science: The Eighth Grade Science curriculum consists of three modules titled “Matter and Energy,” “Motion, Forces, and Energy,” and “Sound and Light.” In the “Matter and Energy” module the students study about the properties of matter, the properties of energy, the properties of atoms and the periodic table, interactions of matter, and the solutions, acids, and bases. In the “Motion, Forces, and Energy” module the students study motion and speed, acceleration, forces, gravity and motion, fluids and pressure, kinetic and potential energy, various machines, electric charges and static electricity , electric currents and charges and technology, and magnets and magnetism. In the “Sound and Light” module the students study the properties of waves, interactions of sound waves and hearing, sound technology, the electromagnetic spectrum, interactions of light, mirrors, and lenses, and light waves, sight, and technology. The students enhance understanding of concepts through virtual and hands-on labs. 5th Grade Math: The 5th Grade Mathematics curriculum consists of the “Everyday Mathematics” series of units and lessons. In the units and lessons, the students study area, perimeter, and circumference of squares rectangles, triangles, quadrilaterals, circles and irregular shapes. The students also study the volume rectangular prisms and irregular shapes. The students spend many lessons on addition, subtraction, multiplication, and division to include fractions and decimals. the students The coordinate plane and other graphs are utilized. Many of the calculations are word problems to include real-world calculations like the volume of the Hillis Tower. 6th Grade Math: The 6th Grade Mathematics curriculum consists of the “Everyday Mathematics” series of units and lessons. The students expand on their previous knowledge of mathematics fundamentals such as adding, subtracting multiplying and dividing by applying those skills to more rigorous problems. The number line and the various categories of numbers from counting numbers, whole numbers, integers, real numbers, rational and irrational numbers. The number line is exploited to include fractions of fractions, absolute values, equalities and inequalities. Area and volume are addressed aggressively with all shapes and sizes. Algebra with word problems with variable are solved. Finally, the coordinate plane, graphs, and statistics are practiced. Sixth Grade mathematics is a major advancement of mathematics disciplines. 7th grade Math: 7th grade uses the curriculum “Connected Mathematics”. The skills and contents are based on the Common Core State Standards. The curriculum is divided into 8 units. The topics that will be covered include; Two and three- dimensional geometry, integers and rational numbers, understanding similiarity, ratios and proportions, linear relationship, probability, and making comparisons and predictions. In each lessons, students are given real world context and do “investigations” to solve a problem or explore a context. Students will work on strengthening how to elaborate on an answer, explain their thinking process, and critique peer work. 8th Grade Math: 8th grade makes builds on top of the concepts from 7th grade. 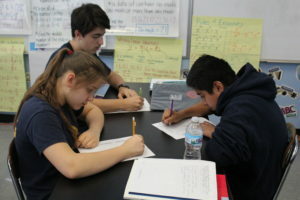 In the 8th grade “Connected Mathematics” curriculum, students explore topics on linear and inverse variation, the pythagorean theorem, exponential function, symmetry and transformations, making sense of symbols, and systems of linear equations and inequalities. Students will also get to explore Algebra I topics such as quadratic functions and other families of functions. In each lessons, students are given real world context and do “investigations” to solve a problem or explore a context. Students will work on strengthening how to elaborate on an answer, explain their thinking process, and critique peer work. In addition to the curriculum, 8th graders will do test preparation to be ready for the entrance exams for high school. We will work on skills that a specific group may need and test taking strategies. 5th Grade ELA – Fifth grade students are taught using the ReadyGEN curriculum. This curriculum is backwards designed, meaning that every activity and assignment builds towards an end-of-unit Performance Based Assessment. There are four different units the students will work through throughout the course of the year and each unit is comprised of two modules. Each module has a text set that is topically related so that students can build content knowledge around the unit theme in each of the modules. Lessons include shared reading, language or reading analysis, conventions and foundational skills mini-lessons, vocabulary, and writing. Students learn how to become independent readers and writers through rich discussion of text and daily writing, using the principles of the gradual release of responsibility model. 5th Grade Social Studies: TCI’s online History Alive! programs transform middle school social studies class into a multi-faceted learning experience. TCI lessons start with a big idea — Essential Question — and incorporate graphic notetaking, groupwork, and step-by-step discovery. Students are the center of instruction that taps a variety of learning styles, allowing students of all abilities to learn and succeed. History Alive! The Ancient World introduces students to the beginnings of the human story. As they explore the great early civilizations of Egypt and the Near East, India, China, Greece, and Rome, students discover the secrets of these ancient cultures that continue to influence the modern world. 6th Grade ELA – Students need to become self-directed in order to be successful in college and careers. myPerspectives engages learners with a student-centered instructional unit structure that promotes ownership of learning. Each unit shifts the focus from teacher responsibility to student responsibility. Media, blogs, films, and multimedia are tied into the curriculum to make texts engaging and exciting for students. myPerspectives takes a student-centered perspective on connecting teens with reading and the world. Students have their own workbook to make learning a hands-on, personal, and engaging experience by allowing them to highlight, underline, and take notes right next to the content. The program is organized into five units. Each unit is structured in the same way with an open-ended Essential Question and activities designed to prepare students for a culminating Performance-Based Assessment. In Unit 1: Childhood, students will read different text selections and think about the challenges and triumphs of growing up. In Unit 2: Animal Allies, students will explore multiple texts to determine how people and animals can relate to each other. In Unit 3: Modern Technology, students will analyze different texts to determine is technology is helpful or harmful to society. In Unit 4: Imagination, students think about where imagination can lead people. In Unit 5: Exploration, students will read texts that help answer the question: What drives people to explore? 6th Grade Social Studies: TCI’s online History Alive! programs transform middle school social studies class into a multi-faceted learning experience. TCI lessons start with a big idea — Essential Question — and incorporate graphic notetaking, groupwork, and step-by-step discovery. Students are the center of instruction that taps a variety of learning styles, allowing students of all abilities to learn and succeed. In History Alive! The Medieval World and Beyond students explore the legacy of civilizations from Europe, Africa, and the Middle East to Asia and the Americas. 7th Grade Language Arts: Students need to become self-directed in order to be successful in college and careers. myPerspectives is an English language arts curriculum for Grades 6–12 that values the perspective of the learner, collectively and individually, and provides next-gen learning experiences that promote higher achievement and develop the competencies needed for college and career readiness. Interactive learning blends print and technology in a student-centered, teacher-inspired classroom. This dynamic Pearson program creates an interactive, engaging, and relevant learning environment through readings, meaningful activities, and purposeful performance tasks. myPerspectives encourages social collaboration as well as student ownership of learning through goal setting, choice, and reflection. The program is organized into five units. Each unit is structured in the same way with an open-ended Essential Question and activities designed to prepare students for a culminating Performance-Based Assessment. In Unit 1: Generations, students deepen their perspective about different generations. In Unit 2: A Starry Home, students deepen their perspective about space and exploration. In Unit 3: Turning Points, students explore turning points in people’s lives. In Unit 4: People and the Planet, students will be provided with another perspective on the topic of the people’s effect on the planet. Finally, in Unit 5: Facing Adversity, students will gain another perspective on the topic of facing adversity. 7th Grade Social Studies: TCI’s online History Alive! programs transform middle school social studies class into a multi-faceted learning experience. TCI lessons start with a big idea — Essential Question — and incorporate graphic note-taking, group work, and step-by-step discovery. Students are the center of instruction that taps a variety of learning styles, allowing students of all abilities to learn and succeed. History Alive! The United States Through Modern Times captures the story of the United States from the precolonial era to the 21st century. 8th Grade Language Arts: Students need to become self-directed in order to be successful in college and careers. myPerspectives is an English language arts curriculum for Grades 6–12 that values the perspective of the learner, collectively and individually, and provides next-gen learning experiences that promote higher achievement and develop the competencies needed for college and career readiness. Interactive learning blends print and technology in a student-centered, teacher-inspired classroom. This dynamic Pearson program creates an interactive, engaging, and relevant learning environment through readings, meaningful activities, and purposeful performance tasks. 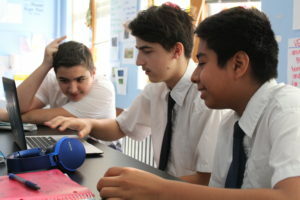 myPerspectives encourages social collaboration as well as student ownership of learning through goal setting, choice, and reflection The program is organized into five units. Each unit is structured in the same way with an open-ended Essential Question and activities designed to prepare students for a culminating Performance-Based Assessment. In Unit 1: Rites of Passages, students will deepen their perspective about rites of passage. In Unit 2: The Holocaust, students will explore multiple texts to deepen their understanding of the Holocaust. In Unit 3: What Matters, students will deepen their perspective about what it means to stand up for things that matter. In Unit 4: Human Intelligence, students will explore the theme that intelligence and knowledge are very valuable. In Unit 5: Invention, students will deepen their perspective about creativity and invention. 8th Grade Social Studies: TCI’s in-depth, online social studies curriculum for middle school students is robust, engaging, and results-focused. Students complete collaborative projects, writing assignments, critical thinking challenges, and problem-solving groupwork. TCI’s middle school programs give students a unique advantage as they prepare for college and beyond.Econ Alive! The Power to Choose demystifies economics for students. A concise, standards-based text and multiple intelligence activities help students grasp complex concepts in terms of understandable real-world situations. In partnership with Loyola University and the Big Shoulders Fund, we offer the Science Education for Public Understanding Program, a hands-on curriculum that focuses on earth, life and physical sciences. High School Readiness Coaching: SNCS strives to ensure that both parents and students are well-informed about the many options for high school education that are available to them. Students are guided in setting goals for themselves as they approach the rigorous application process. Families work closely with the school staff and receive 1-on-1 guidance to assure that students are accepted into the school of their choice based on long-term goal setting sessions and test prep. All students use iPADS with constant teacher monitoring as learning resources which encourage engagement, and compliment the planned lessons and curriculum. iPADS use in the classroom is focused on increasing student achievement by providing teachers with greater opportunities to differentiate instruction and assess student learning using a variety of applications and programs. Our work supports increasing literacy, writing and communication skill development through targeted integrated projects.